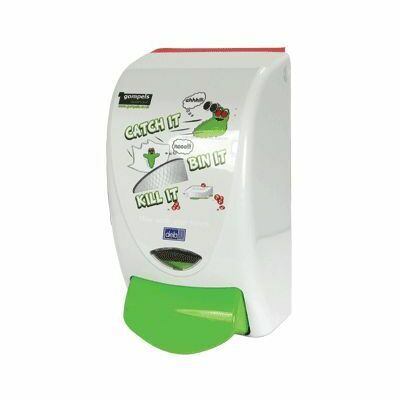 An ideal addition to any nursery or work environment, our brightly coloured Catch it, Bin it, Kill it Liquid Dispenser is sure to capture the eye of all your employees. Designed to encourage regular use and becoming an integral part of your cross-contamination prevention methods, this easily functional dispenser features a large green level that is depressed to allow the antibacterial liquid within to dispense. Easily fitted to the wall with self-adhesive panels, the liquid dispenser boasts a non-clogging mechanism that allows the correct dosage of soap or sanitizer to be removed after each use. The ABS plastic manufacture ensures your dispenser will stand the test of time, even with high-traffic and regular use while the engaging design encourages even the smallest of users to take pride in their hand hygiene. Relax Foam 1ltr x 6.